Horizon Media is forming a new partnership with Management Plus Enterprises (MPE), the creator and owner of the Asics World Series of Beach Volleyball (WSOBV) that will involve several of the agency’s operating units. The alliance is designed to add marketing weight, generate new revenue streams and better engage audiences for what is said to be the second largest international beach volleyball event in the world behind the Olympics. InsideOut, Horizon’s live event production unit, will produce the WSOBV telecast, while Bungalow Horizon, will develop branded content opportunities for clients for the tournament. Horizon's Scout Sports and Entertainment, is spearheading the partnership for the agency. The two sides will develop a new multiplatform event that "captures both the DNA of beach lifestyle, combined with a highly recognized competitive sports platform," says Robert Friedman, CEO of Bungalow Horizon. This year, the third annual tournament will be held August 18-23 in Long Beach, CA and broadcast nationally on NBC. 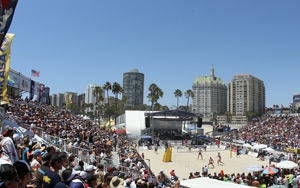 The tournament features more than 128 of the world’s top beach volleyball players as well as a free-admission music festival. Last year, the tournament garnered more than 2.2 million domestic TV viewers and 23 million viewers globally while generating over 750 million media impressions. The partnership was formed following a conversation between MPE founder and CEO, Leonard Armato and Horizon CEO Bill Koenigsberg. “Collaborating with the ASICS World Series of Beach Volleyball allows our clients to engage audiences in new ways,” Koenigsberg said.